FHI Introduces the Newly Developed SUBARU General-Purpose Engine "EK30"
Tokyo, December 17, 2012 - Fuji Heavy Industries Ltd. (FHI), the maker of Subaru automobiles, announced to add EK30 as the top-of-the-range model of the Subaru general-purpose engine EK series for agricultural equipment. The new EK30 will be on production and sale in October, 2013. The EK series, which has been produced since May, 2011, integrates the 2 to 1 gear reducer for slowing down the engine speed ideal for agricultural equipment such as rice planter, cultivator, power sprayer, transporting vehicle, and so on. With four models ranging in displacement from 125cc to 274cc (in maximum output from 4.3HP to 9.7HP) available, the EK series has been marketed mainly to Japanese as well as Asian, including China and Taiwan, agricultural equipment market. The EK30, which will be added to the EK series as the top-of-the-range model of the series, has been developed on the assumption that it is used as the power source for large cultivator, riding rice planter, transporting vehicle, small to medium-sized snow blower, and so on. By its power-setting ideal for agricultural equipment, the EK30 delivers superior power output performance from low through mid-speed area, and it is applicable to heavy duty agricultural equipment for professional users with its tough and persistent power output. The EK30 offers user-friendly and environmentally friendly designs such as less recoil pulling force, which enables even for elder people or woman to start engine smooth and easily, large exhaust silencer for reducing drastically noise level especially in idling. Furthermore, the EK30 can be installed to various types of agricultural equipment with its extensive specifications and technical supports, including wealth of optional parts such as air cleaner. The EK series engine, including EK30, will meet the Japanese exhaust emission voluntary regulation (Phase 3) and Chinese exhaust emission regulation (Stage 2). FHI, in its Industrial Products Company, develops, manufactures and sells Subaru general-purpose engines equipped to construction and industrial machinery or agricultural equipment, as well as high performance engines for vehicles such as snowmobiles or ATVs (All-Terrain Vehicle). 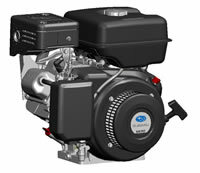 It also builds engine-driven equipment such as generators or water pumps. All its products have won high-level reliability from the customers in all over the world. With introducing this new EK30 engine additional to the EK series engine, FHI aims to further bolstering its engine business as a global general-purpose engine manufacturer who can satisfy diverse needs of customers.